Last week we had the carpets steam cleaned to get rid of the kitty pee and poop stains, and it worked fairly well but the cat must have snuck back in the dining room and peed again 'cos it smells awful in there. So we decided we would have to take up the carpet and put down hardwood floors. That was the start of the process. 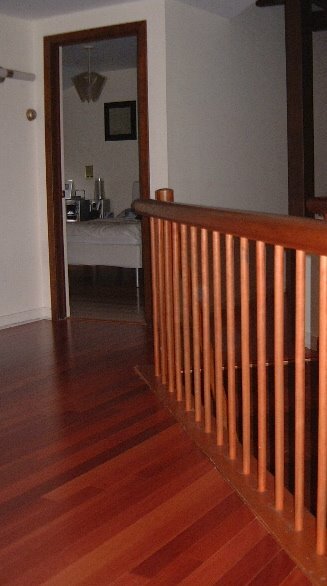 Our first choice would be BR111 Brazilian redwood which is what we put on the landing two years ago (see photo). When we tried to order more of it then our supplier said there was a problem with quality and we'd have to wait a few months to get it. Well, it turns out the problem is more than a temporary hiatus in production and there is no more Massaranduba to be had. This leaves us in a quandary. Do we continue to wait in the hope that more will be released at some future date? Do we pick another hardwood? If so, what? We liked the redwood because it goes with the house (that's a close up of our Californian redwood siding that forms the background on the banner on this site). It is exceptionally hardwaring hard wood, and that's important with two big dogs and cats that are prone to throwing up and peeing in the most inappropriate places. 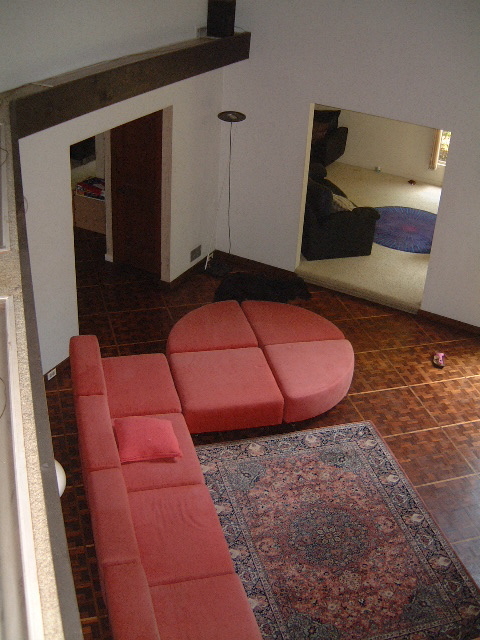 The other issue is it has to fit with the parquet in the foyer and great room that is oak and mahogany. Light wood won't work, there is a lot of wood in the house: beams, stairs, railings, doors and moldings and it's all dark or red toned. And it has to be of the right depth so there won't be a huge step from the foyer to the dining room and the dining room to the kitchen. I really didn't want to do anything about this carpet until we did the kitchen remodel so that at least we could tackle the floor level in one go. But despite copious amounts of my usual secret weapon Nature's Miracle the smell just won't go. I suppose we could just not use the dining room for the next couple of years until we're ready to redo the kitchen but that seems kind of limiting, and getting rid of the kitty and replacing the soiled carpet with new carpet is a no go. So to sum up: we can't get what we want; we really don't want to settle for an interim solution; we can't live with the yucky carpet any longer. Our solution was to tear up the carpet and just put up with whatever is under the carpet until your ideal material becomes available. The only other solution I could come up with was for you to tear up your landing and use those boards in the dining room. Not really a practical solution.. but a possible one. You could remove the carpet and use the paste-on tiles. They are cheap, can be done up in a few hours and last for atleast 4-5 years. You also get some very good colors and designs. As soon as your flooring of choice becomes available you could remove these and get it done.